Today we’d like to introduce you to Marjorie Pezzoli. Marjorie, please share your story with us. a. Art has its serious and joyful sides. Each one is multifaceted. Color creates joy by the release of emotions. It affects all your molecules – color therapy! Art heals. b. Ideas and possibilities intersect, allowing one to paint the past, present, and future. c. Art does not have to be perfect to make an impact. It is a place to let go, explore, and enjoy. You can do no wrong in this creative space. d. It is a connector of people, a beautiful form of non-verbal communication. It can be used to create change, first in yourself, then others. Art has always been important to mankind. 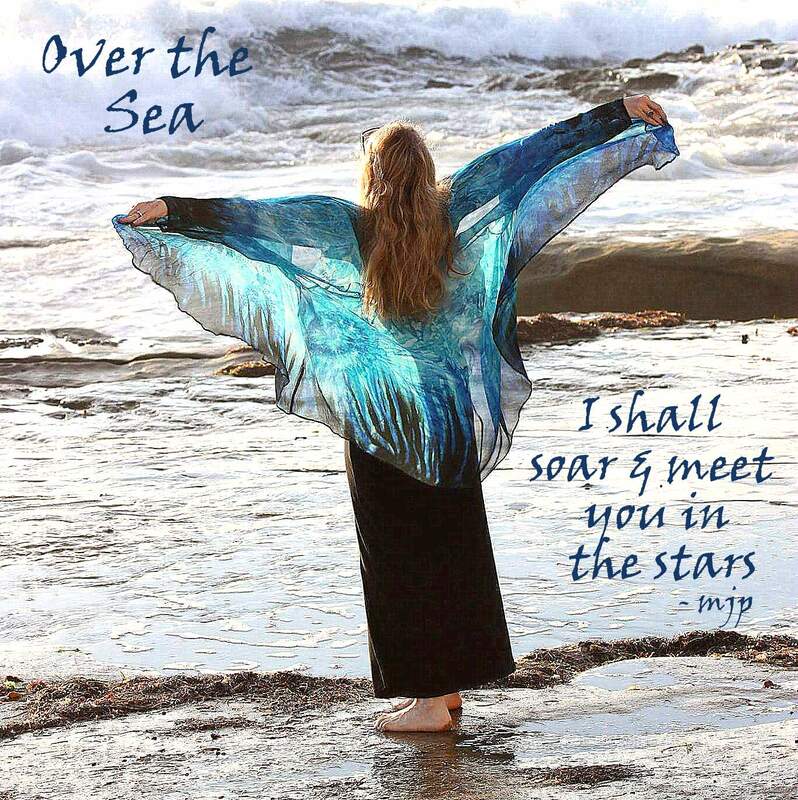 It can take you beyond the stars, back to the sea, and spaces in-between. 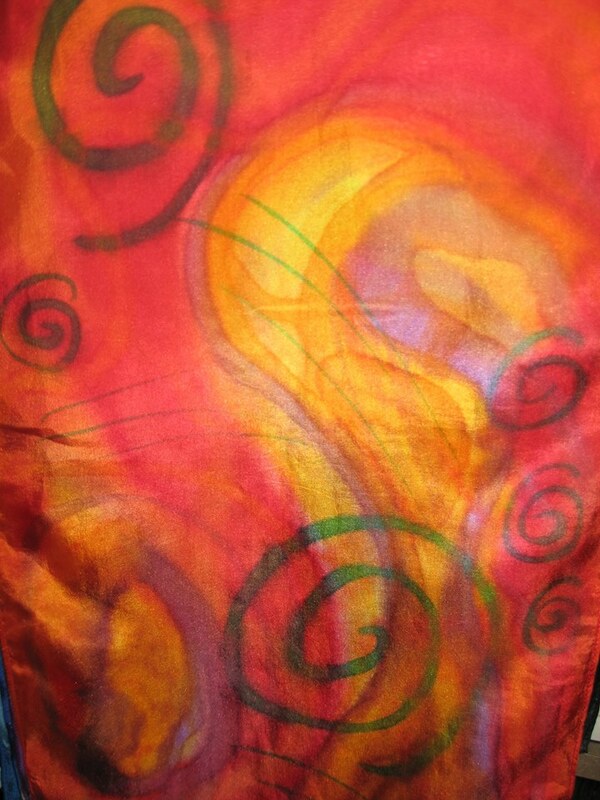 What I love about painting on silk is that it is like painting on air! The colors are amazing. My fabric starts off white and I go from there. I have been drawn to textile arts since the 4th grade when my teacher taught us spinning, weaving, dying, & more! I never get tired of seeing the colors flow across the fabric. This creative process has kept me intrigued for over 25 years. I get a kick out of my students, watching them paint with silk for the first time. The colors spreading and mixing before your very eyes is always magical! 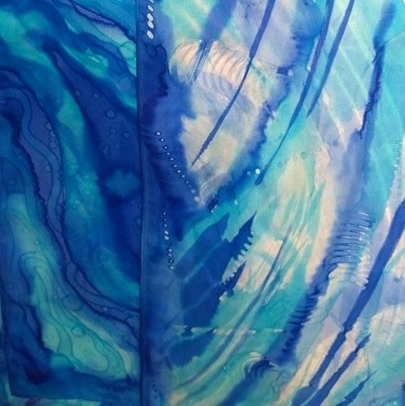 Silk painting is very similar to water color. It has its own quirks and you can create wearable art. I use a variety of steam, heat set, instant set dyes, inks, and resists creating my work. Each one has unique properties that contribute to my designs. When I work with silk, I am reminded that life is not perfect and that when mistakes happen, I can create something more beautiful than I ever imagined. It is about letting go, and I learned not to worry about the unintended design elements. It is best to relax, feel free, and be engaged while painting. Some of my favorite compositions happened by fixing what was initially perceived as mistakes. I now relax and feel freely engaged while painting. Learning to unclutter my mind and be spontaneous puts me in the present moment. This is a wonderful byproduct of my artistry. Nature, texture, and patterns are my favorite subjects, along with my wild imagination. I am currently working on a graphic novel, “The Mayon Chronicles” with my illustrator Ariel J. Fulcher. It is fun to be the storyteller and art director. It started out as a personal project with just only one image but then took on a life of its own. A new journey to say the very least. Learning to see my greatest challenge as a gift has been an ongoing process. I strive to truly understand and appreciate people and the simplest things. Always to go for it, because what is the worst that can happen, nothing. I needed to become a superhero for myself and this is how Mayon came to be. Only by conquering grief in myself could I help others to do the same. My thoughts and consciousness have been expanded for continued cosmic adventures with my lovely Alyssa. My journey is not always easy, but so worth it. Some days are hard, revisiting heartache creates powerful and healing images. Other days it is so exciting to have my story unfold, like seeing a great movie for the first time. “Mayon’s Unchosen Destiny and Amera’s Cosmic Return” is the first in my Sci-Fi Fantasy storyline. My Angel Mermaid girl has been dancing in the stars since 2013, she is tucked in the hearts of many. Her story, my story shall be told in “Layers of Time”… this is still a work in progress. The broken vessel of myself and heart is being repaired and strengthened by a process similar to the Japanese practice of Kintsugi – the art of precious scars – a practice that highlights and enhances the breaks thus adding value to the broken object. Literally golden (“kin”) and repair (“tsugi”). There are many golden threads in my tapestry of life that have helped to mend me. I have found the golden power in my words and thoughts. I hope by sharing my story others will know they can handle whatever comes their way. There is still plenty of joy to be found or created. Marjorie Pezzoli resides in San Diego, California. 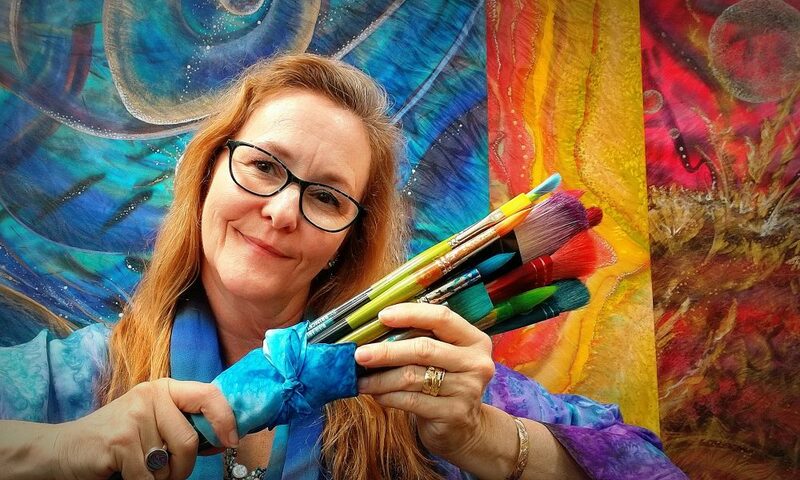 She obtained an Associate Degree from The Art Institute of Fort Lauderdale and her Teaching Artist Certificate from Arts for Learning, San Diego. Marjorie has been a proud member of the San Diego Silk Guild since 2010. 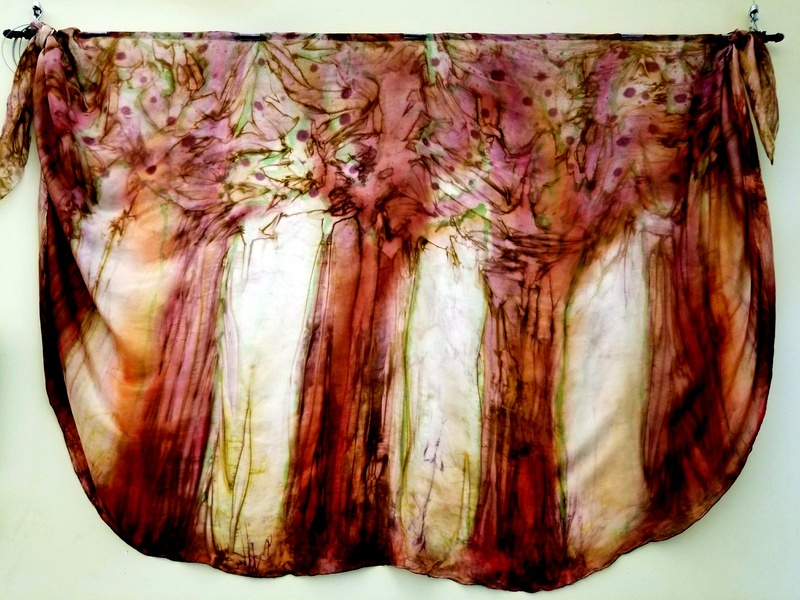 Her work has been featured in a book “The Best of Silk Painting” by Diane Tuckman and Jan Janus. Her silks have accompanied Debbie Solan’s Faerie Dresses on the runway for Leonard Simpson’s Fashion Fundraisers. 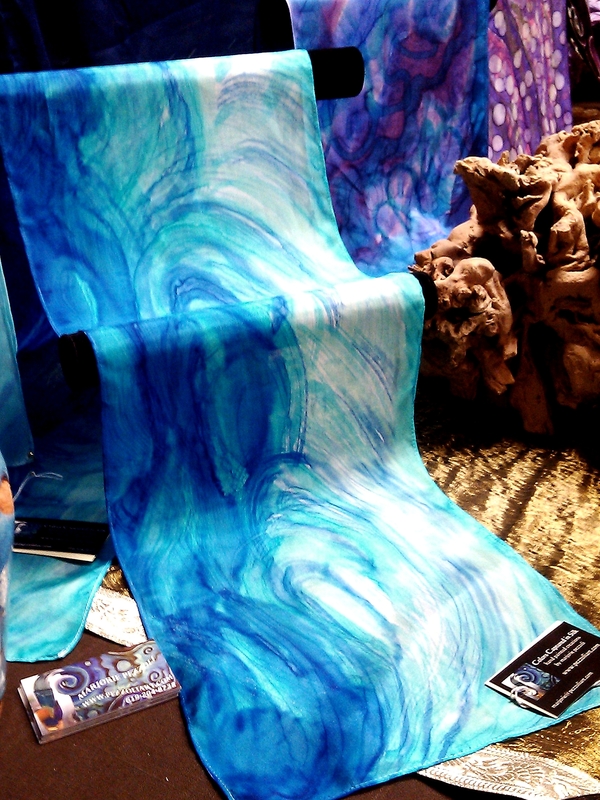 Visionary Dance Theatre & Theatre Arts West have included her large silk wraps & scarves in their productions. She is a member of www.Seachanges.org and www.TheJellygirls.com. Both websites promote environmental conservation, awareness, and solutions. 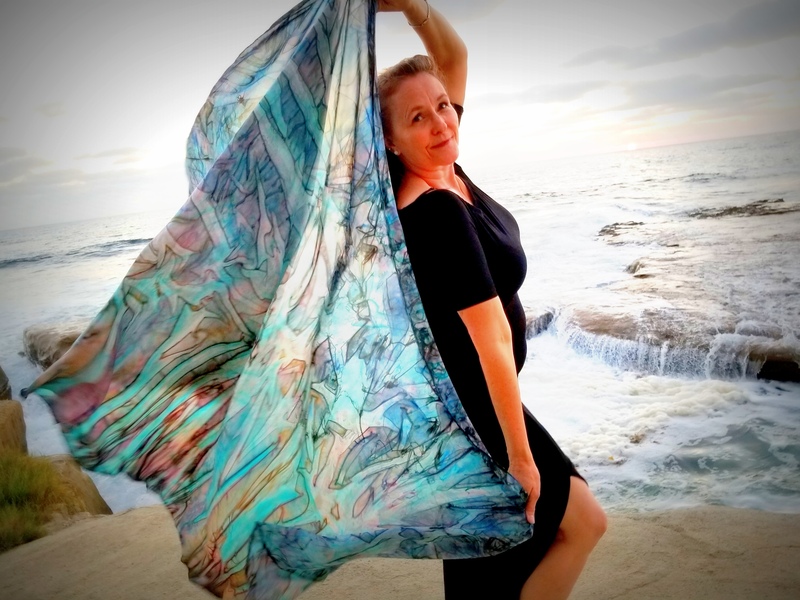 Marjorie is known for her jellyfish and ocean themed silks. Marjorie continues to come up with new patterns, designs, and colorful abstracts. Hand painted silk yardage will soon be available since her purchase of a large commercial steamer to set fabric. 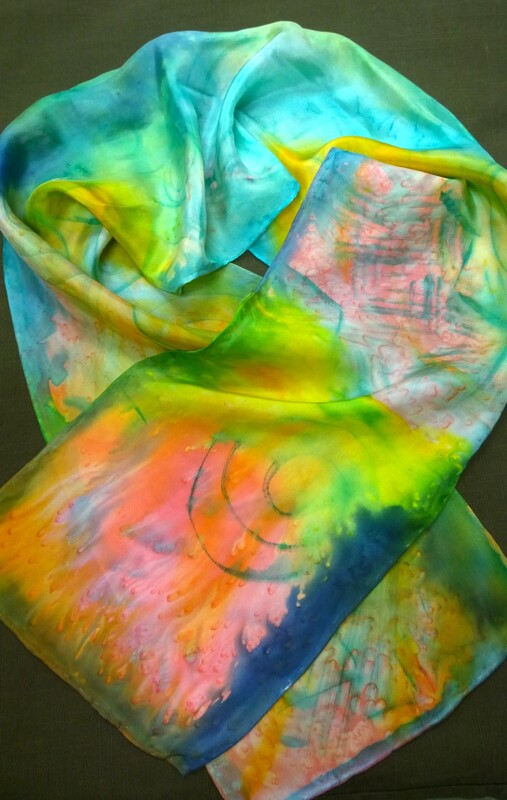 “Silk Quickies and “How can You Resist” workshops are held at Bravo Art School, Idea Field/Fusionglass Co., Pezzoli Art Studio, and on location. Group and private classes available. “Remember, when you were 5 years old and could do no wrong with color.” Marjorie reminds her students of this before their brushes touch the silk. 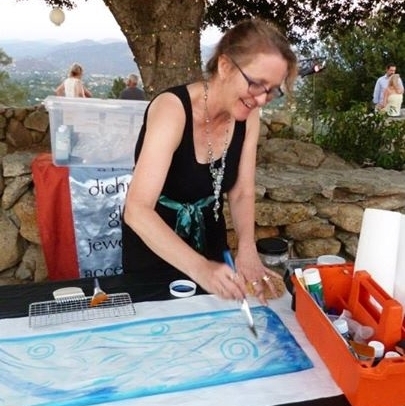 Her work has been shown at the San Diego Airport, The Museum of Monterey, The Oceanside Museum of Art, The Living Coast Discovery Center, The NOAA Monterey Bay National Marine Sanctuary Exploration Center, local Libraries, Solana Beach City Hall, and the Bonita Museum & Cultural Center. Marjorie’s work has been other galleries, boutiques, museums and museum gift shops over the years. Marjorie represents Gary Pezzoli’s work, he is a painter whose explores the dynamic between nature’s designs versus man’s need for order. Those contrasts create the language of his paintings: opposing color, textures, movement, abstracted landforms and water patterns. Gary’s work electrifies the walls of numerous private and commercial art collections throughout the West Coast. You can find it there on their website. Artists will continue to create because that is who we are. There are so many wonderful artists of all kinds in San Diego, it is not always easy to make a living as one. We need to put the A(rt) back into S.T.E.M. education. Art contributes to all endeavors, it is another way to communicate your thoughts and ideas to others. It can open your mind causing you to view the world in a new way and care to make a difference. Show your support for artists by purchasing at local galleries, studios, and boutiques. I will keep creating for myself, it makes life so more enjoyable. Beautifully written with love and creative vision! I can feel you soar!